West Coast International has been working in brokerage, charter, consulting and evaluation for more than twenty years. The charter market is extremely important, especially in the case of maxi-yachts, both because it allows wealthy clients to enjoy this world without taking on the responsibility of ownership and because it allows yacht owners to cover their handling costs. Among other things, the hiring of large boats has become an increasingly more common option for large companies organising conferences, junkets for their employees or as an advertising stunt. The West Coast International's fleet also includes "Toracife", a 1968 Benetti with steel hull that offers maximum comfort during navigation, thanks to the internal and external living quarters and its steel hull fitted with stabiliser fins, ideal for day charter or large events when moored and private or business parties with a holding capacity of up to 100-120 guests. As far back as 1980 when it was called "Empress of Cannes" this motor yacht was already used for charters by its owner, an English gentlemen who, together with his wife, ran the business while simultaneously acting as captain. At that time and in later years, "Empress of Cannes" moored on the C“te d'Azur in the old port at Cannes at the start of the quay near the Palais du Festival and the Casino. With the next owner, the motor yacht was used almost exclusively for moored parties, right at the time when Corporate Charter was taking off, particularly along the C“te d'Azur. Over time, the Benetti has rigorously and regularly undergone maintenance and modernisation work. In particular, in 1990 when "Toracife" underwent major refitting, especially the engines that were dismantled, reconditioned and restored to new. Between 1995 and 1996, the owner at that time replaced most of the equipment, electronic instruments and accessories, bringing "Toracife" up to date with the latest in technology. 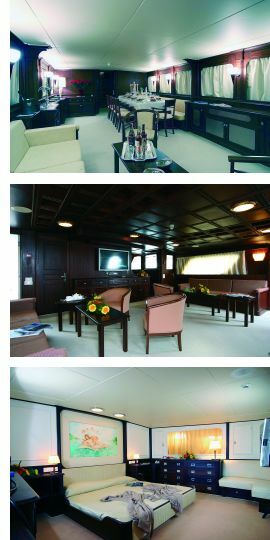 The later and present owners, previously owners of Pierre Cardin's former yacht "Maxime des Mers", also started restoring and modernising the interiors and equipment, fitting it with essential accessories such as satellite TV in each cabin, Internet connection via wireless, numerous electronic games for children and adults with maxi screen, plus "toys" dedicated to bathing activities. Furthermore, "Toracife"'s on board systems were updated with a new desalinator and the installation of a powerful crane capable of raising the on board Boston 16" tender. The interiors have preserved their appeal with furnishings in mahogany with the added luxury of new and elegant upholstery as well as new sets of towels, silverware and sheets. "Toracife" offers six large guest cabins with en suite bathrooms, with comfortable daytime areas well laid out across the three upper bridges. Great care was paid to convivial areas both inside, where there is a double lounge with dining area, and outside, especially on the upper bridge, where further areas dedicate to relaxation and sunbathing have been created. There is everything you would need for a long journey: in fact, on board there is a complete laundry service and vast kitchen area. "Toracife" has adapted perfectly to modern times in relation to safety standards and is presently going through the registration stage to become a Maxi-yacht, something that offers the advantage of VAT exemption in the charter business. For further information: West Coast International; Piazza Sicilia 6; 20146 Milano; tel. +39 335 6171937 - +39 0577 357261 - +39 02 4069269; web site www.westcoastint.com; e mail segreteria@westcoastint.com.